Biochemistry and Molecular Biology of Plants, 2nd Edition. Edited by Bob B. Buchanan, Wilhelm Gruissem and Russell L. Jones. Wiley, 2015. I: Compartments (approx. 238 pages in 5 chapters: Membrane structures and membranous organelles (nicely documenting membranes and organelles as the sites within or upon which much of the biochemistry considered in BMBP2 takes place), The cell wall, Membrane transport, Protein sorting and vesicle traffic, and The cytoskeleton). II: Cell reproduction (c. 266 pages in 6 chapters of seemingly unlikely bedfellows as Nucleic acids, Amino acids, Lipids, Genome structure and organization, Protein synthesis, folding, and degradation, and Cell division). III: Energy flow (approx. 147 pages in 3 substantial chapters entitled Photosynthesis, Carbohydrate metabolism, and Respiration and photorespiration). IV: Metabolic and developmental integration (about 324 pages in 6 chapters – Long-distance transport, Nitrogen and sulfur (English (US) spelling is the order of the day), Biosynthesis of hormones (so refreshing to see that old-fashioned word used in a 21st century text), Signal transduction, Molecular regulation of reproductive development, and Senescence and cell death). V: Plant environment and agriculture (approx. 222 pages in 4 chapters on Responses to plant pathogens, Responses to abiotic stress, Mineral nutrient acquisition, transport and utilisation, and Natural Products (which ends BMBP2 with a reminder of a major resource value of the plant kingdom). A nicely co-ordinated touch is that each chapter starts with an Introduction and ends with a Summary. For what it may be worth, only four of the chapters are single-authored; the other 20 are multi-author, frequently international collaborations. Unusually, for a text book [I think that’s BMBP2’s main categorisation, though more on this later], it is an edited tome. Its 24 chapters are contributed by 75 world-renowned plant biologists, including Howard Thomas and Helen Ougham, who are two of the co-authors of another textbook in the Wiley stable – “The molecular life of plants”. Furthermore, Russell Jones [co-editor of BMBP2] is 1st named on that multi-authored plant biology textbook (Jones et al., 2013). One can’t help but wonder if that causes any marketing/sales conflict for Wiley, which also publishes BMBP2. Or whether it poses any conflicts of interest for Dr Jones’ high level involvement with either publication? Or is it a marketing strategem, two books on similar topics destined for different markets, BMBP2 more for the US/American-influenced Rest of World market, and The Molecular Life of Plants for the UK and its educationally-affiliated countries? Such a long list of contributors shows how big plant science has become – no one person can fully encompass all of its sub-disciplines, details and nuances. And this is just within the relatively circumscribed field of biochemistry and molecular biology of plants – a subset of the much bigger, greater botany subject area. That is not a new phenomenon though; even the highly regarded “Strasburger’s Lehrbuch der Botanik für Hochschulen” first published in 1894 from the outset contained contributions by experts other than Eduard Strasburger [(1844-1912): founder of modern plant cell biology – Volkmann et al., 2012] himself [Bresinsky et al., 2013]. Still, it is a bit of a departure from texts one might be more familiar with that cover similar territory, e.g. Smith et al. (2010) or Jones et al. (2013), which are co-authored by a much smaller team. The content-led bulk of Buchanan et al.’s behemoth is followed by c. 13 pages of Further Reading. Satisfyingly, the overwhelming majority of items here were to scientific papers that were dated post-2002 (the 1st edition’s publication date per the Wiley site), which indicates the proclaimed substantial ‘revision’ and up-to-datedness of the present edition’s text. Intriguingly, though, at least 7 references are from 2015. Why intriguing? The book’s Preface – which you might expect to be the last penned contribution in the book – is dated … November 2014. To further help guide one’s further reading, some chapters have sub-divided listings by subject, e.g. Cytosolic protein synthesis, Protein synthesis in chloroplasts, Protein folding and post-translational modifications, and Protein degradation (for chapter 10), and Cyanogenic Glycosides, Glucosinolates, Alkaloids, and Phenolics (for chapter 24). And there’s even mention of useful websites – in the case of Chapter 8 (lipids). All of which has pedagogic value for eager students. However, useful though these listings of Further Reading no doubt are, BMBP2 would benefit – not least from a teaching point of view – by having statements supported by citing the appropriate references in-text (which would also help to encourage students to cite sources to support the statements – often factually accurate – they may make in their own assignments). Plasmatubules (“tubular evaginations of the plasmalemma associated with sites where high solute flux occurs between apoplast and symplast” – Chaffey and Harris, 1985). Now, I’m assuming these topics – which are relevant to BMBP2’s title – are not covered in the text because they’re not indexed. No, I didn’t have the time to read through every page of the extensive text to see if they were covered within. But the point is that such terms need to be indexed if they are included. Noting that the index was compiled by Indexing Specialists (UK) Ltd, one can only trust they’ve done a full and complete job that gives due credit to the work of the editors, authors and publishers. Whilst I acknowledge it’s up to the authors/editors to decide what to include (or omit), as a botanical generalist those are terms that strike me as being worthy of mention in connection with the book’s subject matter – and was expecting to see in a modern-day text – and whose apparent absence therefrom surprised me. How well BMBP2 serves the more-discerning specialist in plant biochemistry or molecular biology I can’t know. With >1,000 four-colour images (and 500 photographs) throughout the text, BMBP2 is abundantly illustrated. And when the senses are assaulted with so many graphics, it is all too easy to be seduced in to believing that what you see is the truth. But readers must bear in mind that, however persuasive a colour image may be, it is just our current best guess (educated though it no doubt is) at to how these phenomena work, or a chain of events is put together or processes co-ordinated. Still, they do make the text look great, though! But, is it too much to ask that scale bars or other indication of size be added to them – particularly the micrographs? Given the numerous initialisms/abbreviations/acronyms that litter modern-day plant science, I wonder if a separate Glossary would be useful for the readers. Maybe. Or, perhaps the decision has been taken that their inclusion in the Index and guidance to the appropriate pages of text that deals with them is an economical way of accommodating that issue. But adding maybe a dozen or so pages (if that) to the near1300 pages of the existing tome is a small price to pay (providing one doesn’t have to pay much – or any! – extra to the £90 price tag of the paperback version of BMBP2). Regarding the price, it is a big sum, but, if there is only a new edition every 13 years or so, it is probably a reasonable price to demand for such a comprehensive text (a publishing interval between editions/revisions which publishers of undergraduate plant – and general – biology textbooks might like to emulate?). I hesitate to call BMBP2 a textbook because it is probably much more than that. Certainly, it is a very impressive text dealing with the topics it covers – biochemistry and molecular biology of plants – but you’ll still need other texts such as Taiz et al. (2015) (for plant physiology) and Evert and Eichhorn (2012) or Mauseth (2014) (for more general plant biology such as biodiversity and structure). But, BMBP2 has a great part to play in bringing botanical literacy and knowledge to the present generation of students. Furthermore, because of the coverage, which to a generalist botanist seems bordering on the encyclopaedic, of the topics it includes, BMBP2 will also be useful to the established researcher who wants/needs to get an inkling of the current state of play in the specialist biochemical and molecular biology of angiosperms. Whilst one understands that the book’s focus is biochemistry and molecular biology, what is meant by plants in the context of BMBP2? Well, sadly, it’s not explicitly defined in the front of the book – where such important matters need to be addressed. However, when one reads the text it seems pretty clear that the book is angiosperm-biased – i.e. deals predominantly (exclusively?) with flowering plants. Indeed, you’d be hard-pushed to find mention of any member of the plant kingdom apart from those representatives; although Table15.1 (p. 666) stands out in comparing the ultrastructure of sieve elements of mosses (do they really have ‘sieve elements’? ), vascular cryptogams (same question), conifers (which have sieve cells not sieve elements…), and angiosperms (which have sieve tubes composed of numerous end-to-end sieve elements…). And why not concentrate on angiosperms? There are >350,000 species of them (Paton et al., 2008 – or approx. 400,000, per Toni Kutchan et al. on p. 1206), which should represent more than enough challenge for the most intrepid of researchers. Furthermore, the importance of study of that plant group is underlined by the fact that its members represent life or death to a large part of the human population as sources of calories and other dietary components. Supplementing what is in the hard copy entity – and as is increasingly common these days, BMBP2 has a companion website, which, although it is password protected to a degree, is freely accessible by owners of the print edition of the book (or just users thereof(!)). With downloadable Figures (from all 24 chapters) and Tables (from the 17 chapters that have them) these are useful for incorporation into lectures or may even be appropriately incorporated into student assignments. Being ‘free’ this is a great resource to have, the more so because it doesn’t rely on registered adopters being sent a single-use code to access and download all the educational resources that are needed for one’s teaching in one sitting as is the case for several other such textbook-related websites. 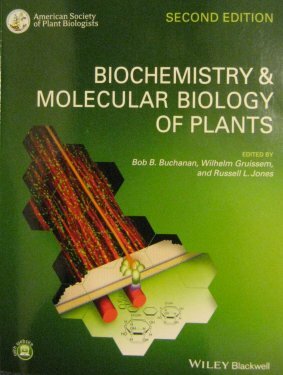 Biochemistry and Molecular Biology of Plants, 2nd edition is a beast, but it’s a user-friendly one that should be welcomed into one’s life to provide much-appreciated companionship to further one’s plant biology studies. Bresinsky A, Körner C, Kadereit JW, Neuhaus G and Sonnewald U (2013) Strasburger’s Plant Sciences [Including Prokaryotes and Fungi]. Springer. Brillouet J-M, Romieu C, Schoefs B, Solymosi K, Cheynier V, Fulcrand H, Verdeil J-L and Conejero G (2013) The tannosome is an organelle forming condensed tannins in the chlorophyllous organs of Tracheophyta. Annals of Botany 112(6): 1003-1014. Chaffey NJ and Harris N (1985) Plasmatubules: Fact or artefact? Planta 165(2): 185-190. Evert RF, Eichhorn SE (2012) Raven Biology of Plants, 8e. WH Freeman. Jones R, Ougham H, Thomas H. and Waaland S (2013) The Molecular Life of Plants. John Wiley & Sons Ltd.
Knoblauch M, Noll GA, Torsten Müller T, Prüfer D, Schneider-Hüther I, Scharner D, van Bel AJE and Peters WS (2003) ATP-independent contractile proteins from plants. Nature Materials 2: 600-603. Larkum AWD, Kühl M. 2005. Chlorophyll d: the puzzle resolved. Trends in Plant Science 10: 355-357. Mauseth JD (2014) Botany: An introduction to Plant Biology, 5e. Jones & Bartlett. Miyashita H, Adachi K, Kurano N, Ikemoto H, Chihara M, Miyachi S. 1997. Pigment composition of a novel oxygenic photosynthetic prokaryote containing chlorophyll d as the major chlorophyll. Plant Cell Physiol. 38: 274-281. Paton AJ, Brummitt N, Govaerts R, Harman K, Hinchcliffe S, Allkin B and Lughadha EN (2008) Towards Target 1 of the Global Strategy for Plant Conservation: a working list of all known plant species—progress and prospects. Taxon 57(2): 602–611. Raboy V (2009) Approaches and challenges to engineering seed phytate and total phosphorus. Plant Science 177: 281–296. Smith AM, Coupland G, Dolan L, Harberd N, Jones J, Martin C, Sablowski R and Amey A (2010) Plant Biology. Garland Science. Taiz L, Zeiger E, Møller IM and Murphy A (2015) Plant Physiology and Development, 6e. Sinauer Associates Inc.
Volkmann D, Baluška F. Menzel D (2012) Eduard Strasburger (1844-1912): founder of modern plant cell biology. Protoplasma 249: 1163-1172.